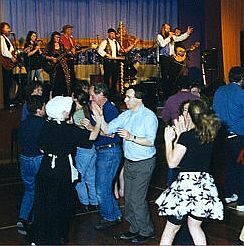 A significant part of Otago's musical and social heritage for 24 years, The Pog Band was a popular addition to weddings, school programmes, community celebrations and festivals around Otago and Southland. 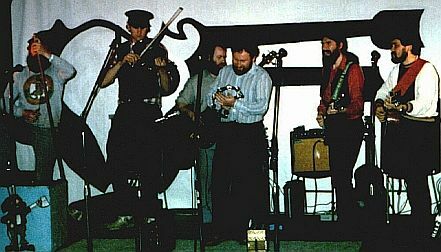 Many of the 40 or so members that have passed through the band ranks have gone on to form other bands or taken up solo careers in folk music. It would be fair to say that no other group has contributed as much to the New Zealand folk music repertoire as the Pog Band over its 24 year history. 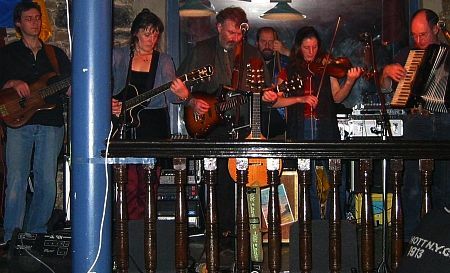 The band was renowned for its interpretation of older folk songs in a classicly kiwi vein as well as their many original songs and poems put to music. The now-famous Southern Man song became inextricably linked with Otago rugby after the band first performed it on the hallowed grounds of Carisbrook before a memorable Otago vs Auckland match. Initailly considered a hack band by other "real" musicians, the Pog Band surprised them with its tenacity and popularity. it seems that people love raw energy and a band that's enjoying itself over precise musicianship every time. That's not to say there were not good musicians in the band; many were fantastic players and singers and every member brought something special and different to the band as the recordings will attest. But there was always an element of the unpolished, home-grown, just-here-for-a-good-time ethos in their presentation. Right through its existance, the band had the lagerphone and bushbass home-made instruments as their centrepiece. The Pog Band was more than just a bunch of musicians though, it was a concept that endured for its lifetime. No single member ran the full course of the band's existance but many were there for more than half of it. New members brought their own particular talent or personality to the existing blend, always shaping it and redirecting it. The repertoire was largely picked up by osmosis (there were few band practices) and it wasn't uncommon for a new song to be unleashed on stage by one person with the rest of the band fumbling to pick up the chords or melody. Play it again at the next gig and it was on the setlist. The Pog Band became the envy of other bands for the amount of gear it amassed. At one stage there were two trucks, a large PA system, lights and instruments that the band all owned jointly. In its early days, there were several electricians and technicians in the band and gear was mantained and sometimes manufactured on the fly before, after and even during gigs. Because the basic determination of the band was to have a good time, there was not a great focus on money. Members were initially happy with small personal payouts to keep the band coffers healthy and so recording projects or gear purchases were well supported. This concept changed as the band approached its last days, with members taking more cash and the band entity becoming somewhat impoverished with dilapidating gear. Interestingly, the band lost much of its good-time element at the same time - a correlation that's worth noting. There's no doubt that during the last 10 years of the band it became a very polished unit musically. Arrangements were interesting and complex, vocal harmonies were tighter and the the range of instrumentation was highly varied from song to song. But this improvement came at a cost. The band was now taking itself seriously and as a result, lost some of its immediacy. Individuals felt less able to be spontaneous and take a few risks for fear of upsetting the practised arrangement and unnerving other band members. At the same time there was a noticeable decline in gigs coming the band's way. One reason might have been that it had become a little over-exposed in Otago's sesqui-centennial year (1998) as it featured in many different community celebrations. Another reason, reported anecdotally from independant observers, was that the Pog Band had lost its fun element. This site is run by Mike Moroney from Dunedin, New Zealand.